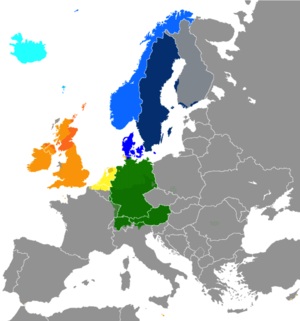 The three most prevalent West Germanic languages are English, German, and Dutch. The family also includes other High and Low German languages including Afrikaans and Yiddish (which are daughter languages of Dutch and German, respectively), in addition to other Franconian languages, like Luxembourgish, and Ingvaeonic (North Sea Germanic) languages next to English, such as the Frisian languages and Scots. Additionally, several creoles, patois, and pidgins are based on Dutch and English as they were languages of colonial empires. Elbe Germanic, ancestral to the Upper German dialects of Old High German and the extinct Langobardic language. If indeed Proto-West-Germanic existed, it must have been between the 2nd and 4th centuries. Until the late 2nd century AD, the language of runic inscriptions found in Scandinavia and in Northern Germany were so similar that Proto-North-Germanic and the Western dialects in the south were still part of one language ("Proto-Northwest-Germanic"). After that, the split into West and North Germanic occurred. By the 4th and 5th centuries the great migration set in which probably help diversify the West Germanic family even more. Grouping of the main Germanic languages, including historical dialects, according to Friedrich Maurer. Note that divisions between subfamilies of continental Germanic languages are rarely precisely defined; most form dialect continua, with adjacent dialects being mutually intelligible and more separated ones not. The original vowel system of West Germanic was similar to that of Proto-Germanic; note however the lowering of the long front vowels. dei day dag m. Tag m. dæġ m. tag m. *dagă m. *dagaz m.
sibbe sibling[note 1] sibbe f. Sippe f. sibb f. "kinship, peace" sippa f., Old Saxon: sibbia sibbju, sibbjā f. *sibjō f. "relationship, kinship, friendship"
twa skiep two sheep twee schapen n. zwei Schafe n. twā sċēap n. zwei scāfa n. *twai skēpu n. *twai(?) skēpō n.
bed bed bed n. Bett n. bedd n. betti n. *badjă n. *badją n.
^ Original meaning "relative" has become "brother or sister" in English. ^ Hammarström, Harald; Forkel, Robert; Haspelmath, Martin, eds. (2017). "West Germanic". Glottolog 3.0. Jena, Germany: Max Planck Institute for the Science of Human History. ^ Ringe, Don. 2006: A Linguistic History of English. Volume I. From Proto-Indo-European to Proto-Germanic, Oxford University Press, p. 213-214. ^ Wolfram Euler: Das Westgermanische – von der Herausbildung im 3. bis zur Aufgliederung im 7. Jahrhundert — Analyse und Rekonstruktion (West Germanic: From its Emergence in the 3rd Century to its Split in the 7th Century: Analyses and Reconstruction). 244 p., in German with English summary, London/Berlin 2013, ISBN 978-3-9812110-7-8. ^ Graeme Davis (2006:154) notes "the languages of the Germanic group in the Old period are much closer than has previously been noted. Indeed it would not be inappropriate to regard them as dialects of one language. They are undoubtedly far closer one to another than are the various dialects of modern Chinese, for example. A reasonable modern analogy might be Arabic, where considerable dialectical diversity exists but within the concept of a single Arabic language." In: Davis, Graeme (2006). Comparative Syntax of Old English and Old Icelandic: Linguistic, Literary and Historical Implications. Bern: Peter Lang. ISBN 3-03910-270-2. ^ Ringe and Taylor. The Development of Old English. Oxford University Press. pp. 114–115. ^ a b sources: Ringe, Don / Taylor, Ann (2014) and Euler, Wolfram (2013), passim.